Download "ASBESTOS MANAGEMENT. a) Responsible for the oversight and adherence of all employees to the Asbestos Management program." 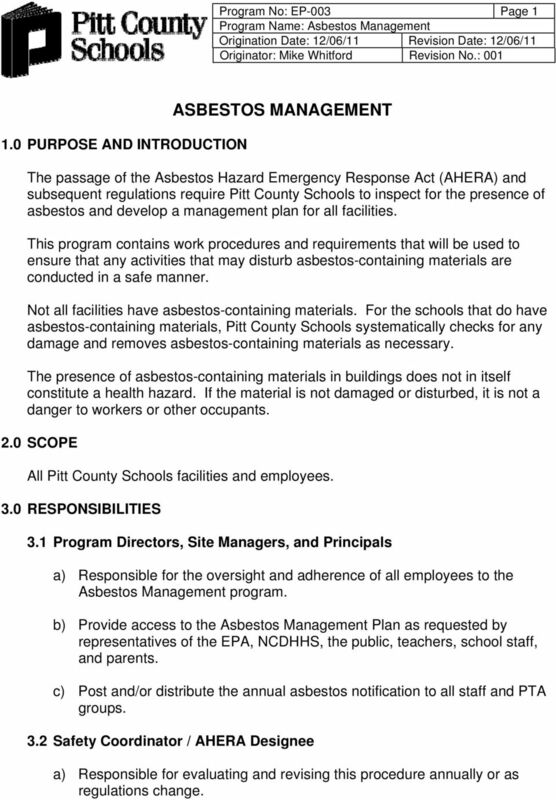 1 Program No: EP-003 Page PURPOSE AND INTRODUCTION ASBESTOS MANAGEMENT The passage of the Asbestos Hazard Emergency Response Act (AHERA) and subsequent regulations require Pitt County Schools to inspect for the presence of asbestos and develop a management plan for all facilities. This program contains work procedures and requirements that will be used to ensure that any activities that may disturb asbestos-containing materials are conducted in a safe manner. Not all facilities have asbestos-containing materials. 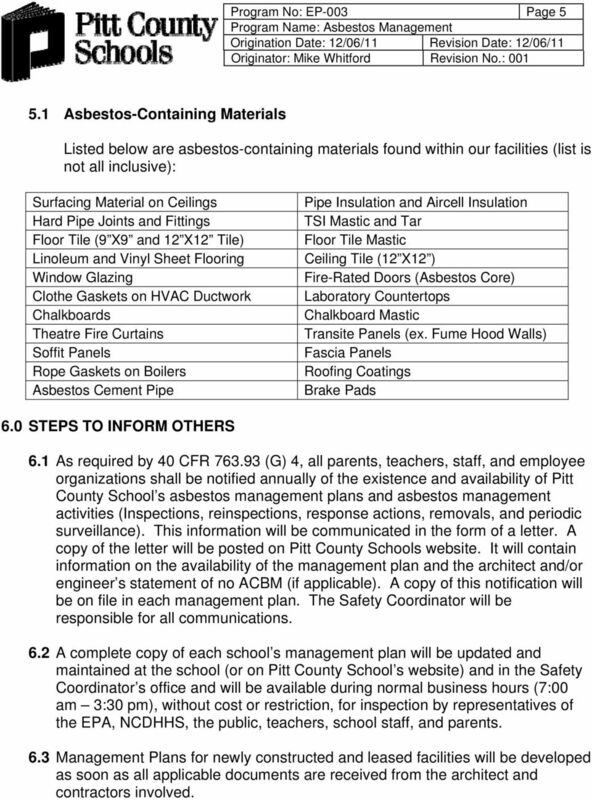 For the schools that do have asbestos-containing materials, Pitt County Schools systematically checks for any damage and removes asbestos-containing materials as necessary. The presence of asbestos-containing materials in buildings does not in itself constitute a health hazard. If the material is not damaged or disturbed, it is not a danger to workers or other occupants. 2.0 SCOPE All Pitt County Schools facilities and employees. 3.0 RESPONSIBILITIES 3.1 Program Directors, Site Managers, and Principals a) Responsible for the oversight and adherence of all employees to the Asbestos Management program. 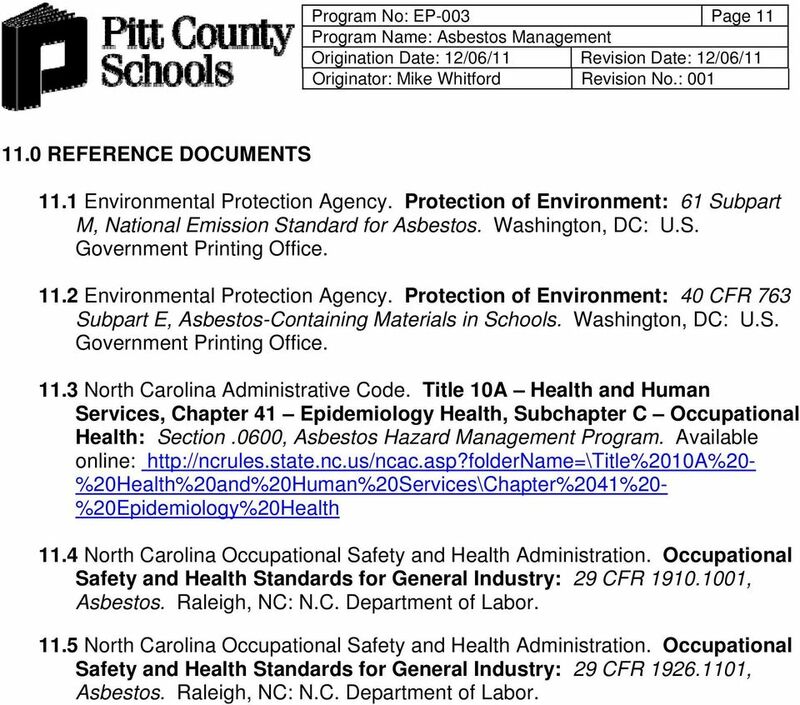 b) Provide access to the Asbestos Management Plan as requested by representatives of the EPA, NCDHHS, the public, teachers, school staff, and parents. c) Post and/or distribute the annual asbestos notification to all staff and PTA groups. 3.2 Safety Coordinator / AHERA Designee a) Responsible for evaluating and revising this procedure annually or as regulations change. 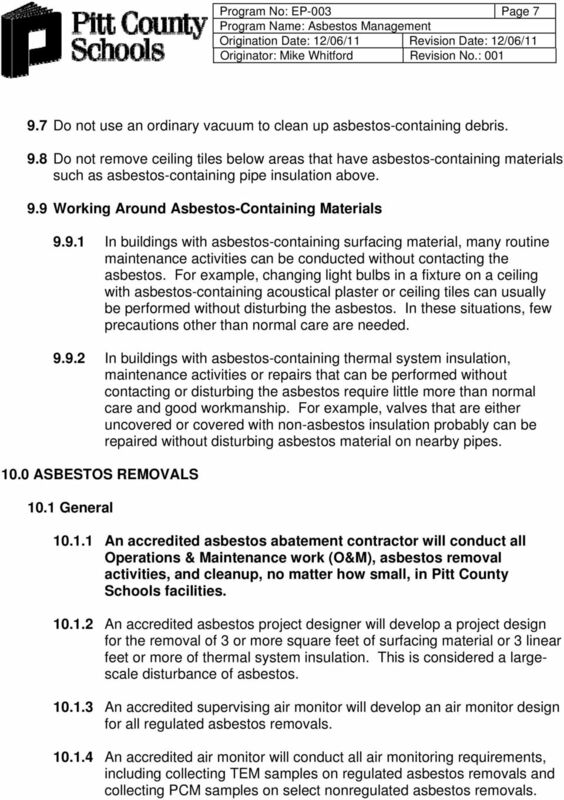 2 Program No: EP-003 Page 2 b) Conduct three-year asbestos inspections for all facilities. c) Manage the asbestos management plans for all facilities. d) Implement response actions for damaged asbestos materials. 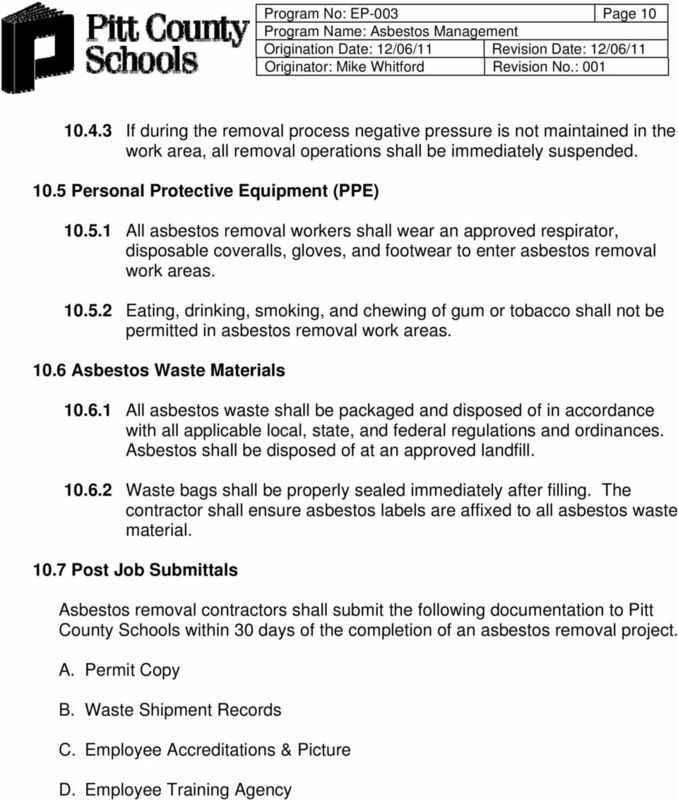 e) Annually notify all parents, teachers, staff, and employee organizations of the existence and availability of Pitt County School s asbestos management plans and asbestos management activities (Inspections, reinspections, response actions, removals, and periodic surveillance). f) Ensure all asbestos materials in routine maintenance areas are properly labeled. g) Conduct periodic on-site inspections of asbestos removal projects. 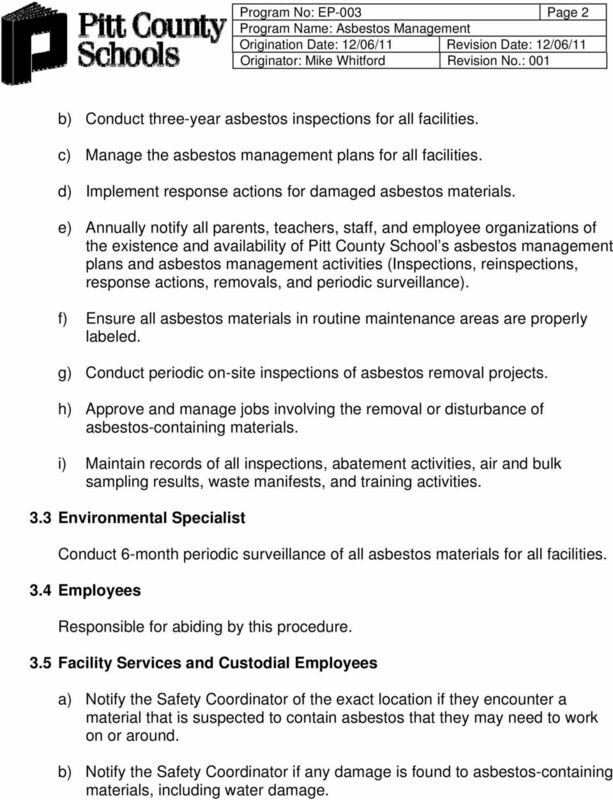 h) Approve and manage jobs involving the removal or disturbance of asbestos-containing materials. i) Maintain records of all inspections, abatement activities, air and bulk sampling results, waste manifests, and training activities. 3.3 Environmental Specialist Conduct 6-month periodic surveillance of all asbestos materials for all facilities. 3.4 Employees Responsible for abiding by this procedure. 3.5 Facility Services and Custodial Employees a) Notify the Safety Coordinator of the exact location if they encounter a material that is suspected to contain asbestos that they may need to work on or around. b) Notify the Safety Coordinator if any damage is found to asbestos-containing materials, including water damage. 4 Program No: EP-003 Page 4 Miscellaneous Material Interior building material on structural components, structural members, or fixtures, such as floor tile, ceiling tile, shingles, wall panels, and adhesives. Nonfriable Asbestos material that when dry may not be crumbled, pulverized, or reduced to powder by hand pressure. PCM Phase Contract Microscopy. A method of analyzing air samples for asbestos fibers. PCM is not as precise as TEM. PLM Polarized Light Microscopy. A method of analyzing bulk samples for asbestos in which the sample is illuminated with polarized light and viewed under a light microscope. Surfacing Material Asbestos material that is sprayed-on, troweled-on, or otherwise applied to surfaces, such as acoustical plaster on ceilings and fireproofing materials on structural members, or other material on surfaces for acoustical, fireproofing, or other purposes. TEM Transmission Electron Microscopy. A method of analyzing air samples for asbestos fibers using a transmission electron microscope. TSI Thermal System Insulation. Asbestos material that is applied to pipes, fittings, boilers, tanks, ducts, or other interior structural components to prevent heat loss or gain, or water condensation, or for other purposes. TSI can be found as aircell insulation or hard-mudded fittings and joints. VCT Vinyl Composition Tile. 5 Program No: EP-003 Page Asbestos-Containing Materials Listed below are asbestos-containing materials found within our facilities (list is not all inclusive): Surfacing Material on Ceilings Hard Pipe Joints and Fittings Floor Tile (9 X9 and 12 X12 Tile) Linoleum and Vinyl Sheet Flooring Window Glazing Clothe Gaskets on HVAC Ductwork Chalkboards Theatre Fire Curtains Soffit Panels Rope Gaskets on Boilers Asbestos Cement Pipe Pipe Insulation and Aircell Insulation TSI Mastic and Tar Floor Tile Mastic Ceiling Tile (12 X12 ) Fire-Rated Doors (Asbestos Core) Laboratory Countertops Chalkboard Mastic Transite Panels (ex. Fume Hood Walls) Fascia Panels Roofing Coatings Brake Pads 6.0 STEPS TO INFORM OTHERS 6.1 As required by 40 CFR (G) 4, all parents, teachers, staff, and employee organizations shall be notified annually of the existence and availability of Pitt County School s asbestos management plans and asbestos management activities (Inspections, reinspections, response actions, removals, and periodic surveillance). This information will be communicated in the form of a letter. A copy of the letter will be posted on Pitt County Schools website. It will contain information on the availability of the management plan and the architect and/or engineer s statement of no ACBM (if applicable). A copy of this notification will be on file in each management plan. The Safety Coordinator will be responsible for all communications. 6.2 A complete copy of each school s management plan will be updated and maintained at the school (or on Pitt County School s website) and in the Safety Coordinator s office and will be available during normal business hours (7:00 am 3:30 pm), without cost or restriction, for inspection by representatives of the EPA, NCDHHS, the public, teachers, school staff, and parents. 6.3 Management Plans for newly constructed and leased facilities will be developed as soon as all applicable documents are received from the architect and contractors involved. 6 Program No: EP-003 Page INSPECTIONS 7.1 Every three years Pitt County Schools conducts a reinspection of all facilities to assess the condition of identified and any newly discovered asbestos This information is kept in the management plan, which is located in the Principal s Office of each school. In addition, copies of all management plans are located in the Safety Coordinator s Office. 7.2 Prior to the demolition of a building or structure, a NESHAP inspection shall be conducted. 7.3 If an employee encounters a material that is suspected to contain asbestos that they may need to work around or on, it is their responsibility to notify the Safety Coordinator of the exact location. 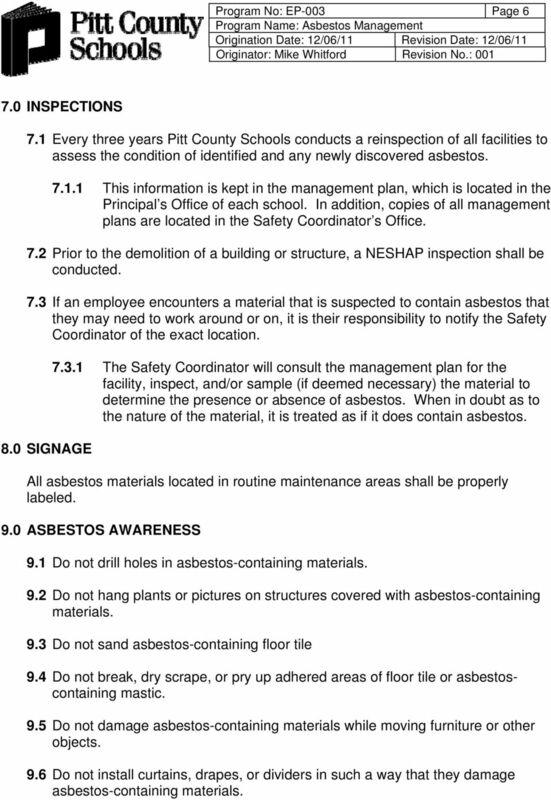 8.0 SIGNAGE The Safety Coordinator will consult the management plan for the facility, inspect, and/or sample (if deemed necessary) the material to determine the presence or absence of asbestos. When in doubt as to the nature of the material, it is treated as if it does contain asbestos. All asbestos materials located in routine maintenance areas shall be properly labeled. 9.0 ASBESTOS AWARENESS 9.1 Do not drill holes in asbestos-containing materials. 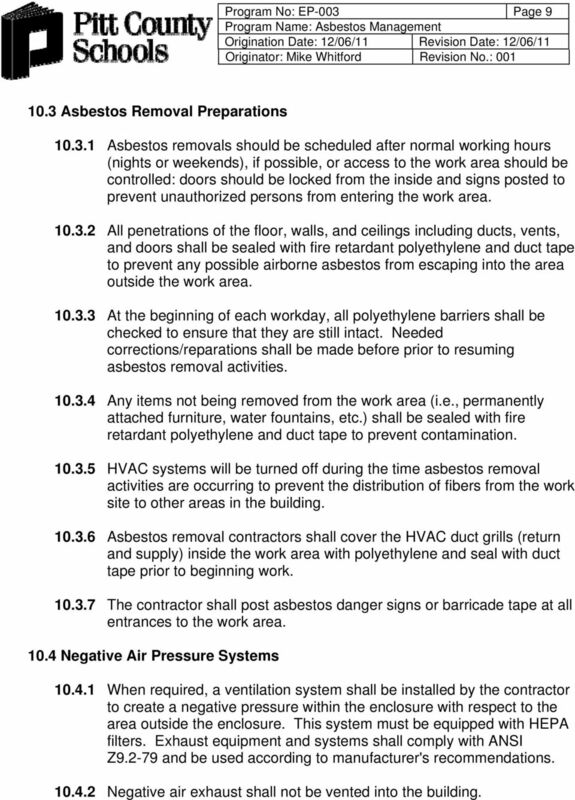 9.2 Do not hang plants or pictures on structures covered with asbestos-containing materials. 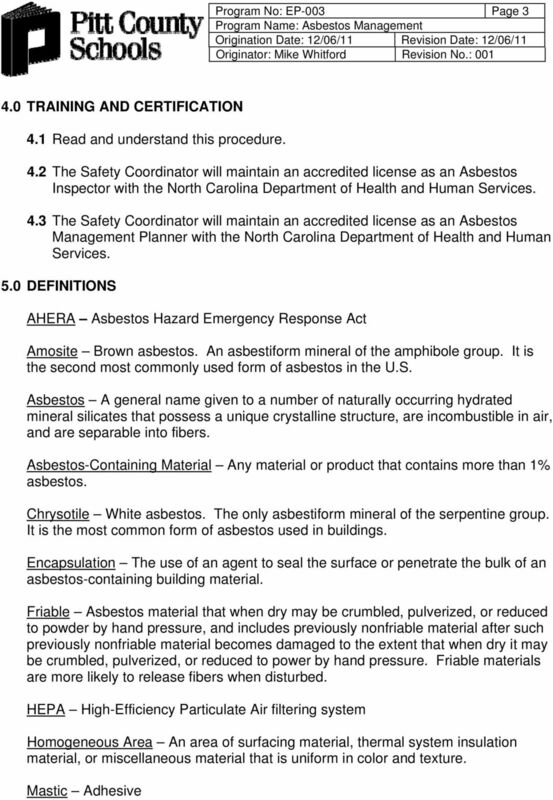 9.3 Do not sand asbestos-containing floor tile 9.4 Do not break, dry scrape, or pry up adhered areas of floor tile or asbestoscontaining mastic. 9.5 Do not damage asbestos-containing materials while moving furniture or other objects. 9.6 Do not install curtains, drapes, or dividers in such a way that they damage asbestos-containing materials. 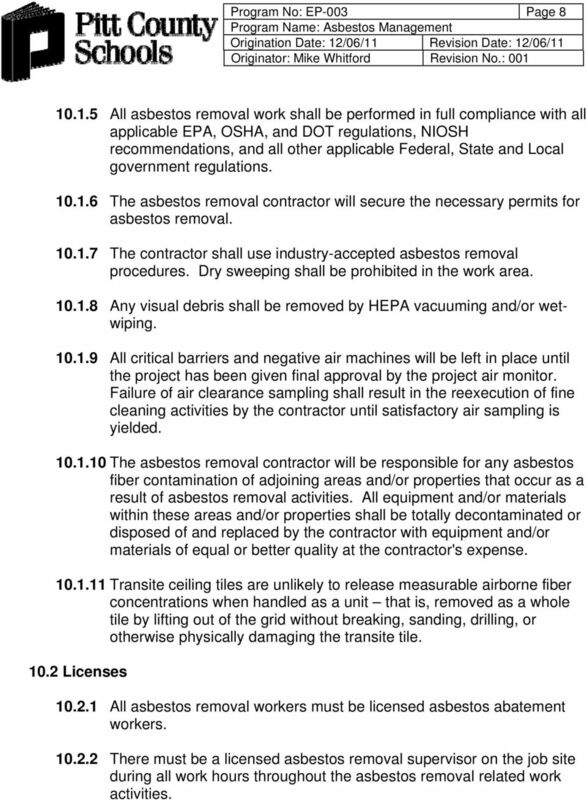 7 Program No: EP-003 Page Do not use an ordinary vacuum to clean up asbestos-containing debris. 9.8 Do not remove ceiling tiles below areas that have asbestos-containing materials such as asbestos-containing pipe insulation above. 9.9 Working Around Asbestos-Containing Materials In buildings with asbestos-containing surfacing material, many routine maintenance activities can be conducted without contacting the asbestos. For example, changing light bulbs in a fixture on a ceiling with asbestos-containing acoustical plaster or ceiling tiles can usually be performed without disturbing the asbestos. In these situations, few precautions other than normal care are needed In buildings with asbestos-containing thermal system insulation, maintenance activities or repairs that can be performed without contacting or disturbing the asbestos require little more than normal care and good workmanship. For example, valves that are either uncovered or covered with non-asbestos insulation probably can be repaired without disturbing asbestos material on nearby pipes ASBESTOS REMOVALS 10.1 General An accredited asbestos abatement contractor will conduct all Operations & Maintenance work (O&M), asbestos removal activities, and cleanup, no matter how small, in Pitt County Schools facilities An accredited asbestos project designer will develop a project design for the removal of 3 or more square feet of surfacing material or 3 linear feet or more of thermal system insulation. This is considered a largescale disturbance of asbestos An accredited supervising air monitor will develop an air monitor design for all regulated asbestos removals An accredited air monitor will conduct all air monitoring requirements, including collecting TEM samples on regulated asbestos removals and collecting PCM samples on select nonregulated asbestos removals. 8 Program No: EP-003 Page All asbestos removal work shall be performed in full compliance with all applicable EPA, OSHA, and DOT regulations, NIOSH recommendations, and all other applicable Federal, State and Local government regulations The asbestos removal contractor will secure the necessary permits for asbestos removal The contractor shall use industry-accepted asbestos removal procedures. Dry sweeping shall be prohibited in the work area Any visual debris shall be removed by HEPA vacuuming and/or wetwiping All critical barriers and negative air machines will be left in place until the project has been given final approval by the project air monitor. Failure of air clearance sampling shall result in the reexecution of fine cleaning activities by the contractor until satisfactory air sampling is yielded The asbestos removal contractor will be responsible for any asbestos fiber contamination of adjoining areas and/or properties that occur as a result of asbestos removal activities. All equipment and/or materials within these areas and/or properties shall be totally decontaminated or disposed of and replaced by the contractor with equipment and/or materials of equal or better quality at the contractor's expense Transite ceiling tiles are unlikely to release measurable airborne fiber concentrations when handled as a unit that is, removed as a whole tile by lifting out of the grid without breaking, sanding, drilling, or otherwise physically damaging the transite tile Licenses All asbestos removal workers must be licensed asbestos abatement workers There must be a licensed asbestos removal supervisor on the job site during all work hours throughout the asbestos removal related work activities. 9 Program No: EP-003 Page Asbestos Removal Preparations Asbestos removals should be scheduled after normal working hours (nights or weekends), if possible, or access to the work area should be controlled: doors should be locked from the inside and signs posted to prevent unauthorized persons from entering the work area All penetrations of the floor, walls, and ceilings including ducts, vents, and doors shall be sealed with fire retardant polyethylene and duct tape to prevent any possible airborne asbestos from escaping into the area outside the work area At the beginning of each workday, all polyethylene barriers shall be checked to ensure that they are still intact. Needed corrections/reparations shall be made before prior to resuming asbestos removal activities Any items not being removed from the work area (i.e., permanently attached furniture, water fountains, etc.) shall be sealed with fire retardant polyethylene and duct tape to prevent contamination HVAC systems will be turned off during the time asbestos removal activities are occurring to prevent the distribution of fibers from the work site to other areas in the building Asbestos removal contractors shall cover the HVAC duct grills (return and supply) inside the work area with polyethylene and seal with duct tape prior to beginning work The contractor shall post asbestos danger signs or barricade tape at all entrances to the work area Negative Air Pressure Systems When required, a ventilation system shall be installed by the contractor to create a negative pressure within the enclosure with respect to the area outside the enclosure. This system must be equipped with HEPA filters. Exhaust equipment and systems shall comply with ANSI Z and be used according to manufacturer's recommendations Negative air exhaust shall not be vented into the building. 11 Program No: EP-003 Page REFERENCE DOCUMENTS 11.1 Environmental Protection Agency. Protection of Environment: 61 Subpart M, National Emission Standard for Asbestos. Washington, DC: U.S. Government Printing Office Environmental Protection Agency. 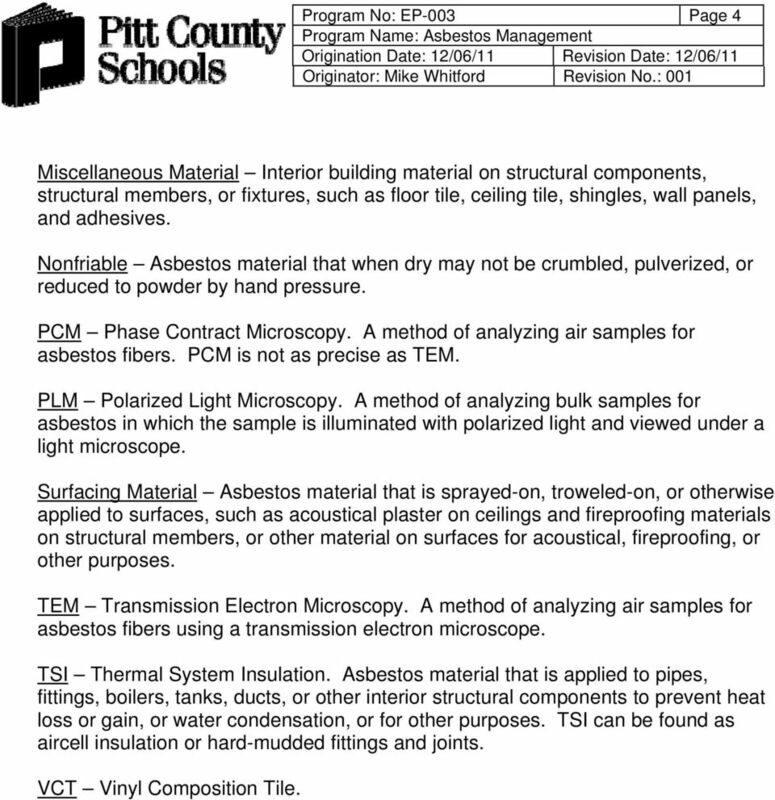 Protection of Environment: 40 CFR 763 Subpart E, Asbestos-Containing Materials in Schools. Washington, DC: U.S. Government Printing Office North Carolina Administrative Code. Title 10A Health and Human Services, Chapter 41 Epidemiology Health, Subchapter C Occupational Health: Section.0600, Asbestos Hazard Management Program. Available online: %20Health%20and%20Human%20Services\Chapter%2041%20- %20Epidemiology%20Health 11.4 North Carolina Occupational Safety and Health Administration. Occupational Safety and Health Standards for General Industry: 29 CFR , Asbestos. Raleigh, NC: N.C. Department of Labor North Carolina Occupational Safety and Health Administration. Occupational Safety and Health Standards for General Industry: 29 CFR , Asbestos. Raleigh, NC: N.C. Department of Labor. ASBESTOS BACKGROUND INFORMATION Asbestos Facts What is Asbestos? Asbestos is a mineral. It is a natural rock mined from the ground. Most of the asbestos used in this country comes from Quebec in Canada. ASBESTOS BUILDING INSPECTION REPORT. for the. City of East Lansing Waste Water Treatment Plant East Lansing, Michigan 48823. ASBESTOS BUILDING INSPECTION REPORT. for. Michigan State University Office of Environmental Safety East Lansing, Michigan 48823. MARYLAND DEPARTMENT OF THE ENVIRONMENT 1800 Washington Boulevard Baltimore MD 21230 410-537-3000 1-800-633-6101 www.mde.state.md. Page No. : Subject: Asbestos-Containing Material Any material found to contain 0.5% or greater content of asbestos by dry weight. 34 ASBESTOS. Where is it? ASBESTOS HAZORD EMERGENCY RESPONSE ACT (AHERA) INSPECTION & REPORT OF FIINGS FOR IUSTRIAL ARTS 1200 N. COLORADO WINSLOW, ARIZONA Submitted to: MR. RICHARD WILLIAMS BELFOR PROPERTY RESTORATION 23610 N.
Asbestos in Your Home You may have some asbestos in your home, but may not be sure what it is, what it looks like, or what to do about it. Just because asbestos is there doesn't mean there's a problem.